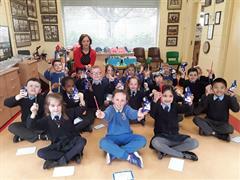 Green Schools: Litter A big thank you to Ms Kerrigan’s wonderful class. They completed a whole litter pick to help keep our school clean! Please continue to support our zero waste in lunchboxes by using kitchen paper to replace plastic. W.O.W. Walk once a Week. We continue to promote healthy & sustainable travel (W.O.W.) continuing this week. 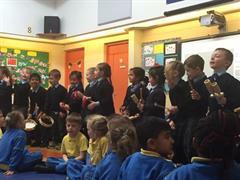 Our junior infants will participate in travel workshops later in the year. Saving Energy: A big thank you to our hardworking Green Reps who help us save energy in our school. Date for your dairy: Spooky WOW (Walk Once a Week) Thursday October 25th Children will dress up in Halloween costumes on the day. More details next week. 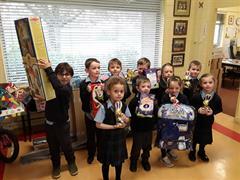 Junior Infants Photos: Proofs of Junior Infants photos went home last week. If you wish to purchase your child’s photo please return proof and money in the envelope provided by tomorrow Friday 12th October. Thank you. Hearing Testing: The H.S.E. will conduct Hearing Testing in the school for our Junior Infants next Tuesday and Wednesday. Beebots: We have a set of Beebots on loan in the school for the next two weeks! All our pupils will have access to them and engage with basic programming at their own class level. Check website for exciting photos! This also coincides with Maths Week (15th – 19th) and our classes will also be undertaking Maths Trails around our school and in the local environment. Road Safety Month: This is Road Safety and Fire Safety month. Our Junior Infants have all received their Hi-Viz jackets and please encourage them to use them as we approach the winter season. We will also have Fire Drill in the school and this also coincides with fire safety talks as we approach Halloween. School Closures: School will be closed on Friday 26th October due to the Presidential Election /Blasphemy Referendum as our school campus is used as a voting station. Mid-Term Break takes place from Monday 29th October to Friday 2nd November inclusive. School reopens on Monday 5th November.